Deep inside the heart of Memphis, yes, Memphis, Tennessee, the Home of the Blues, the Bluff City, there is a small, devoted group of underground bass music fans. 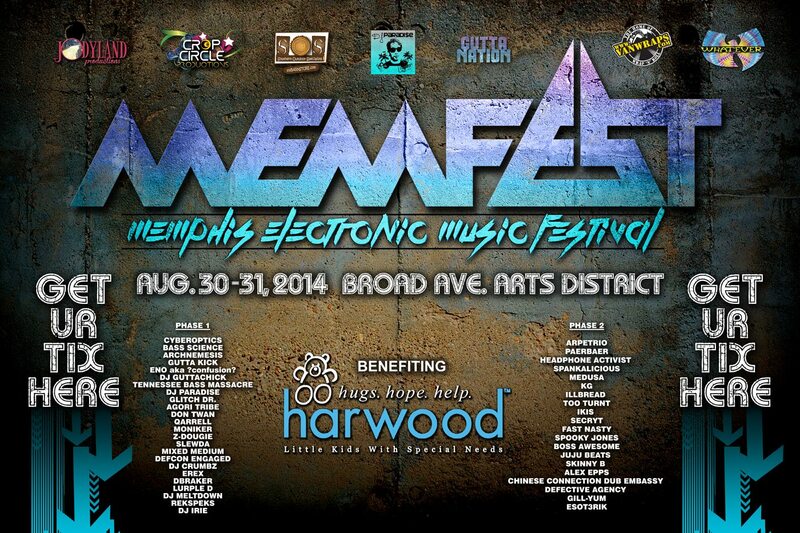 The scene has gradually gained more and more traction over the past few years, culminating in last year’s inaugural installment of the Memphis Electronic Music Festival (M.E.M.Fest), hosted at the Levitt Shell with late night sets at Newby’s. 2013’s lineup featured headliners such as Zoogma, Spankalicious, Zebbler Encanti Experience, Soulacybin and Memphis favorites Gutta Kick, dBraker and Mixed Medium. Despite an unfortunate last minute cancellation from Liquid Stranger, due to travel issues, the weekend was an overwhelming success, and Memphis bass fans have been clamoring for more ever since. The masterminds behind the Memphis bass music scene are local DJ favorite Nolan Leake (aka Gutta Kick) and lights and entertainment specialist Jodyland of Jody Land Entertainment and Crop Circle Productions. These two gentlemen and their respective organizations have put on multiple weekly, biweekly and monthly events around the Memphis metropolitan area, attracting talent from all over the U.S. and beyond and bringing in attendees from far and wide. For M.E.M.Fest’s second installment, Leake and Jodyland have a brand new location in store and an already stellar Phase 1 and Phase 2 lineup announced, with a third phase on the way. The new location makes up the Broad Avenue District in Midtown Memphis, and the guys have already promised a vast array of visual artists, hula hoop workshops, fire spinners and vendors. Notable acts from the first two phases of the lineup include Archnemesis, Spankalicious, Cyberoptics, Arpetrio and Moniker, along with multiple Memphis favorites such as Gutta Kick, DJ Gutta Chick, Agori Tribe, Chinese Connection Dub Embassy, Mixed Medium, Defcon Engaged, dBraker, Gill-Yum and more! M.E.M.Fest 2014 is an all ages event, with early bird tickets, VIP packages and backstage pass packages available, and benefiting the Hardwood Center. Hardwood is a non-profit organization that has provided support and education for children up to five years old with developmental disabilities, such as autism, Down syndrome, cerebral palsy and more, since 1957. Check out the full Phase 1 and Phase 2 lineups below, and stay tuned for Phase 3 of this already stacked list of DJs, producers and bands, from all subgenres of bass music, coming at you soon. Also below are links to the event page, tickets and the Hardwood Center.